The razor-thin Senate race in Florida erupted into outright partisan warfare Friday as Democrats pressed for a recount and Republicans – including President Trump – accused local election officials of tilting the outcome against them. Republicans offered no evidence that fraud was to blame for a diminishing lead in heavily Democratic Broward County in South Florida, where the still-unfinished counting of absentee and provisional ballots has narrowed Republican Rick Scott’s statewide lead to less than one-half of a percentage point. The margin is expected to trigger a recount of ballots, which could begin as early as Saturday in counties across the state. But it has also prompted an uproar from Republicans. 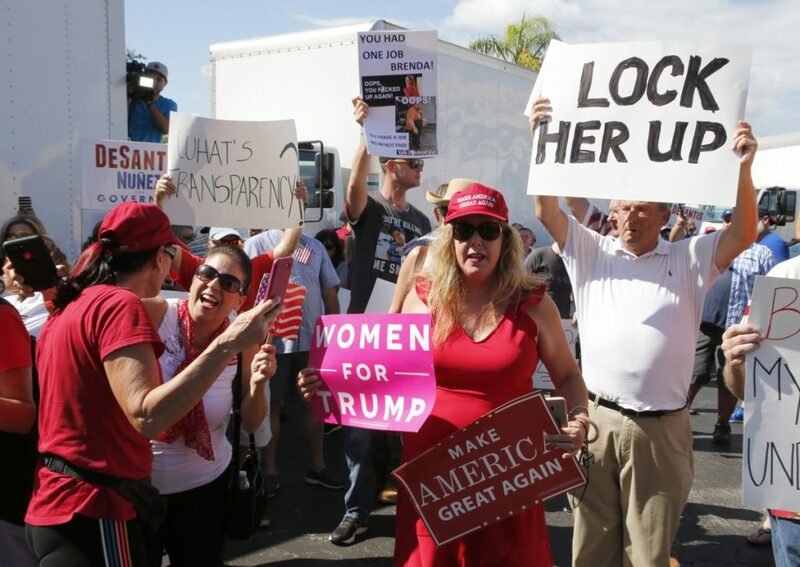 In addition, protesters took to the sidewalks outside the county’s election offices in Lauderhill to demand the ouster of Brenda Snipes, the supervisor of elections in Broward, who has faced a string of accusations over the last decade over mismanaged elections. 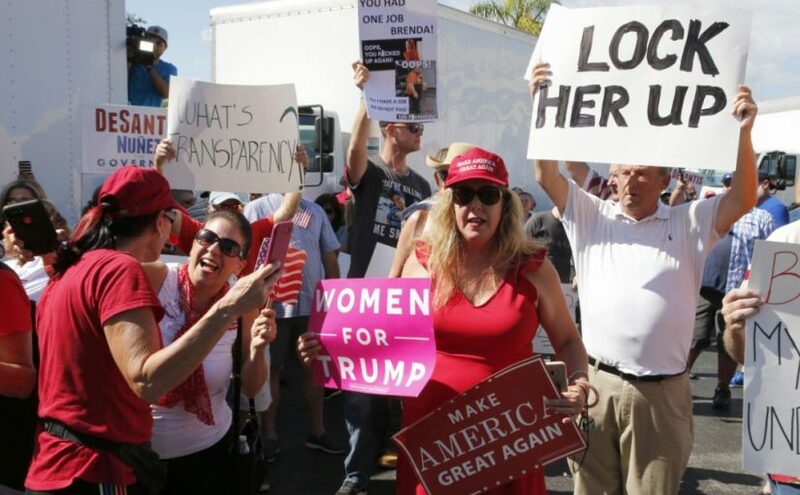 A lawyer for Democrat Bill Nelson, Marc Elias, said in a call with reporters Friday that the canvass underway in Broward and elsewhere in Florida is a “feature, not a flaw, of our democratic system” to be sure all valid votes are counted. He accused Republicans of falsely claiming voter fraud simply because the margin had changed. “The lead is just over 15,000 votes now, which seemed to cause the governor to hold an impromptu news conference to acknowledge the shrinking state of the margin,” Elias said. Both campaigns filed lawsuits Thursday. Scott accused Broward and Palm Beach county election officials of fraud, but offered no evidence beyond procedural errors and Scott’s dwindling vote margin. Nelson’s suit seeks to re-examine absentee and provisional ballots when signatures on the ballots don’t match voter registration records. In Georgia last week, a federal judge ordered local election officials to stop throwing out ballots based on signature issues. The Scott campaign lashed out at the suit. “Their desperation has driven them to ask the federal courts to allow voter fraud,” Scott campaign manager Jackie Schutz Zeckman said. In the Senate race, Scott had a lead over Nelson Friday afternoon of just more than 16,000 votes, or 0.19 percent, according to The Associated Press. In the governor’s race, Tallahassee Mayor Andrew Gillum, D, trailed former congressman Ron DeSantis, R, by more than 36,000 votes, or 0.45 percent. Under Florida law, a statewide machine recount is conducted when the margin of victory is less than 0.5 percent. Tyler Hubbard and Brian Kelley of award-winning country duo Florida Georgia Line expanded their ever-growing empire once again with the opening of a brand new creative compound in Nashville. The property is home to three businesses: meet + greet, Tree Vibez Music and Tribe Kelley Trading Post. Each company offers something different to Nashville’s budding business and entertainment industries. With 2,471-square-foot of work and meeting space, meet + greet features five rooms, two private balconies, an organic espresso bar and a picturesque outdoor space. Rooms are available to rent for guests and members. Tree Vibez Music is a publishing company founded by Hubbard and Kelley in 2015. The home office boasts a recording studio and writing rooms for the company’s entire roster, which features artists and songwriters such as RaeLynn and Canaan Smith. Lastly, the Tribe Kelley Trading Post is a unique storefront featuring clothing and accessories from the Tribe Kelley brand, which was founded by Kelley and his wife Brittney. Finding a gorgeous, tree-lined property in the middle of Nashville wasn’t an easy feat, but once Kelley stumbled upon this particular piece of land, the men knew they had to have it. Giving back to the Nashville music community is one of Florida Georgia Line’s biggest passions. This new compound will allow them to do just that. New artists have a lot to learn from the duo’s success. Since the release of their debut single, “Cruise,” in 2012, Florida Georgia has catapulted into superstardom. They have sold out stadiums, earned 16 chart-topping singles and they currently hold the title for the longest-running No.1 (48 weeks and counting) on the Billboard Hot Country Songs chart with “Meant to Be” with Bebe Rexha. The opening of the creative compound follows the duo’s other successful business ventures, which include the launch of Old Camp Whiskey and the opening of FGL House, their 22,000-square-foot restaurant in Nashville. The guys admit the empire they’ve built is pretty surreal, but want fans to know they don’t take a second of it for granted. “We had a pretty big dream and God just kind of took that dream and multiplied it bigger than we could have ever even imagined,” Hubbard says with a smile. In the midst of their busy careers as singers, songwriters and entrepreneurs, they do make a point to step back and soak it all in every now and then. “It’s been amazing what one dream can lead to, and what great music and great songs can lead to, and the opportunity now that we get to create of other people… it’s so fulfilling,” Hubbard adds. Obama traveled the world. Trump goes to Florida. Donald Trump has evinced a notable lack of curiosity about many aspects of the job he claimed to want. One that stands out — and that is particularly galling for the supposed leader of the free world, and in stark contrast to President Obama — is a disinclination thus far to travel outside the country’s borders. It was clear early on in the presidential campaign that Donald Trump was more interested in winning the election than in actually doing the daily work involved with the job, as the laughably thin list of his so-called “historic accomplishments” during his first 100 days shows. He has demonstrated his mental laziness and utter lack of curiosity in understanding of the world time and time again. From his shifting positions on NATO, to needing a history lesson from the president of China on the subject of North Korea, to his varied inappropriate behavior toward the prime minister of Australia, the prime minister of Japan, and German Chancellor Angela Merkel — who also had to give Trump a schooling on his supposedly signature issue of trade — Trump has proven that it is a markedly small world in which he lives. When Obama took office, he immediately faced the task of improving the United States’ standing around the world, after the damage done on a global scale by the George W. Bush administration. And Obama took that job seriously, logging thousands of miles within the first 100 days after his inauguration in 2009. According to the poll, only 29 percent of Americans believe “leaders of foreign countries around the world have respect for the President.” That is less than half of the 67 percent of people who believed Obama was respected by foreign leaders at this point in his presidency, and it even trails the 49 percent who believed this of George W. Bush. Considering his embarrassing encounters with many world leaders thus far, and his clear preference for authoritarians and dictators, it is difficult to say whether Trump traveling to other countries would actually be helpful. But it is supposed to be part of the job of president of the United States. Instead, Trump seems content to merely occupy the role, rather than embody it. 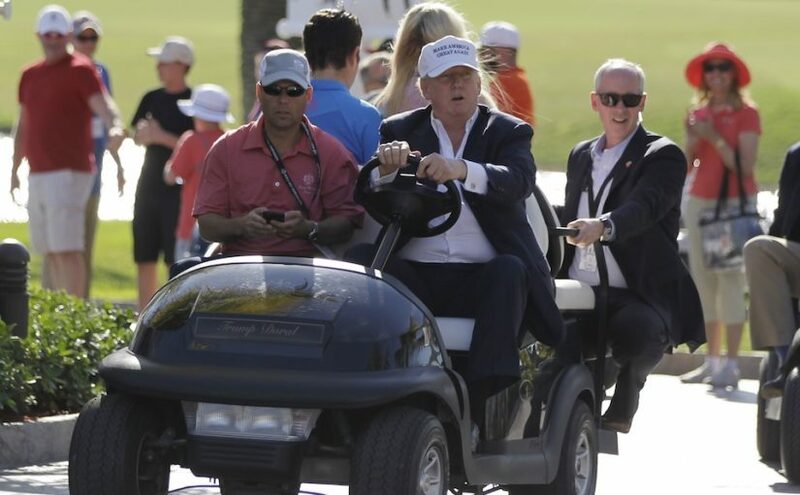 Trump spends much of his time — and taxpayer dollars — traveling to his resort in Florida. And he will occasionally travel to other states when he has the chance to grandiosely pat himself on the back, however unearned the personal kudos may be. But there is a whole world out there with which the United States president ought to be thoughtfully engaged. Obama understood this well. But Trump? He surely has a tee time to meet. Two hospitals in Orlando, Florida, will not bill survivors of the Pulse nightclub mass shooting, the Orlando Sentinel reported on Wednesday. Instead, the Orlando Health and Florida Hospital will write off an estimated $5.5 million (approximately Rs 36.8 crore) in medical costs for those injured in the June 12 massacre, in which 49 people were killed. Orlando Health President David Strong called the Pulse shooting a “horrendous tragedy” and said the waiving of medical fees was the company’s way of showing its support to the community. While health insurers providing coverage to those treated by Orlando Health will receive bills, the hospital will write off anything not covered by their policies. Meanwhile, Florida Hospital said it will not bill the survivors’ insurers and will forego issuing fees for any follow-up surgeries those injured will need. “We hope this gesture can add to the heart and goodwill that defines Orlando,” said Florida Hospital Chief Executive Officer Daryl Tol. Orlando Health treated 44 of those injured in the shooting, while Florida Hospital treated 12, according to CNN. A man, later identified as Omar Mateen, opened fire at the gay nightclub in an “organised and well-prepared” attack. While the Islamic State group had claimedresponsibility for the carnage, investigators said there was no direct evidence linking them to the crime committed by the 29-year-old shooter.